I am not feeling in a particularly nice mood so I am not obliged to be generous or polite – the people who run Nigeria’s Corporate Affairs Commission are the First Born Sons of Satan (FBSS). They are the Devil’s Ambassadors in Nigeria carrying out his work for him. The Vanguard carried a long story today about how the utter shamelessness of this organisation and how it cannot successfully run a tap let alone a bureaucracy. It is the story of how a body has chosen to be unreformable and will regress to the mean no matter how many times you try to change it. Completely smashing it is the only solution. Make no mistake though – this is not anyhowness. That is a different phenomenon on its own. There is a bureaucracy at its worst – existing for no other reason other than to generate more bureaucracy ergo, any attempt to reduce some of this bureaucracy is resisted. Barely two years after it was commissioned by the Minister of Trade and Investment, Mr. Olusegun Aganga, the 24 hours registration of businesses by the Corporate Affairs Commission, CAC, has collapsed due to technical hitches occasioned by server failure. No, there is no server failure anywhere. Not at all. In fact, nothing has failed. The system is working precisely how the FBSS want it to work – it is a characteristic of a bureaucracy to ‘make work’ where there is none. There is no Fermat’s Theorem to solve – simply putting a lot of these things online will cut the time to do register a company considerably and make things easier for everyone. For nearly a decade, the FBSS have been resisting going online. Perhaps they have had no electricity since then. But the clue as to the reason for their behaviour is plain to see – even when they ‘experimented’ with going online, they still wanted people to come down to their office to complete the transaction ‘online’. Is this because you cannot collect a bribe online? Is it because you need physical interaction to facilitate a lot of corruption? I don’t know, you tell me. One of the most annoying things about the Trade and Investment Minister, Olusegun Aganga, is that he has a habit of announcing things to much fanfare and newspaper headlines and then moving on to the next thing. As if, things are supposed to work by magic. He had also at the time directed that a complaints register be opened for anyone who is not able to get his company registered within 24 hours. This he said was to show that, “We mean business and that we care about our customers. If the FBSS have resisted online registration since 2005, defeating this 24 hour ‘announcement’ would have been no more than a cake walk for them. If Aganga cared about making business registration easier, he would not have left it to simply an announcement especially when the thing never worked for more than 5 minutes. We can assume that one of the main reasons why people register a business is to make money. Yet the people charged with being gatekeepers to this very business registration process are not interested in making money themselves. It’s not so difficult to conduct a name search if people are motivated to do it, yet the FBSS drag their feet and do it at their own pace (they also close to the public at 2pm everyday…no doubt after doing massive work). Their incentives are clearly elsewhere. Why is business registration so important? The answer is in the failure rate of businesses. The benefit to society only materialises when those businesses start to make money, pay taxes and employ people. None of these is guaranteed. Instead, what is almost certainly guaranteed is failure – perhaps only 3 out of every 10 new businesses will survive past their second year maybe. Or to put it another way, to get 3,000 successful businesses, you need to register maybe 10,000 of them and be prepared for the vast majority to end up as failures. By handing control of this process to the FBSS, we are preventing the necessary failure that leads on to success from happening. This is why making it easier to do business is such an important reform for countries. Beyond the actual reforms, it is a signal as to what kind of society a nation wants to be. Signalling that you are open for business is telling would be entrepreneurs that its ok come and fail so you can succeed. Instead what are we doing? Almost every indicator worsened from 2013 to 2014. 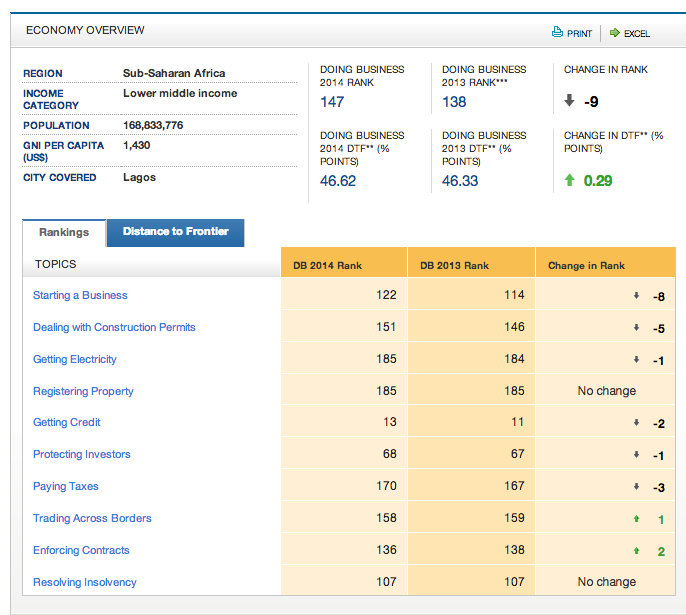 On Starting a Business, where the FBSS hold sway, we dropped down 8 places on the rankings. With Kenya launching mobile company registration today, it is almost certain that we will do worse next year. People who stand in the way of doing business really are the children of the devil. They are economic Boko Haram. The thing they are preventing from happening is the greatest known antidote to poverty in the history of man. We need to wake up and resist this madness. And we haven’t even spoken about the ridiculous costs of registering a business -charging a fortune for the privilege of having your business registered in 2 or 3 months. I can totally relate to your frustrations with registering a business. It took me one month, close to 100, 000 naira, and several angry calls to the hapless lawyer I had contracted to register my company in Abuja 2012, and 20 minutes and no cost (except maybe the bill I pay monthly for WIFI) to register the same company (as a sole trader) in England. Have you tried to do anything with NAFDAC? If you’re this frustrated with CAC, you’d probably commit suicide. 1 week is probably the best available in Nigeria. I’m not aware “1 Day” (from scratch) ever worked, because you need to stamp your memorandum and articles of association at the Stamp Duties Office first and that already takes 2-3 days. After stamping, you can pay for “same day” registration at CAC, but that takes at least 36 hours and an extra N50k (official fee), plus a little “pushing around/facilitation” money. You, know I wont, and I am sure most Nigerians wont, mind 1 or 2 weeks provided you know its going to happen in that time and the process works. Forget even 24 hours. Do it in a week and stick to it.